Experience apartment living where every feature is designed for you. This is The Next Level In Living. 1333 Wabash is designed for the the dedicated urban dweller by Chicago Architect Brininstool + Lynch. While the exterior of the building is visually stunning, the interior residences are modern, warm and welcoming. Nothing has been sacrificed in delivering these upscale Chicago apartments. From the moment you walk through the door, you'll know you are home. The kitchens at 1333 South Wabash where created for the chef who loves a clean European-style workspace. With ample room to move around they're perfect whether you're entertaining a group or simply treating yourself to a home-cooked meal. 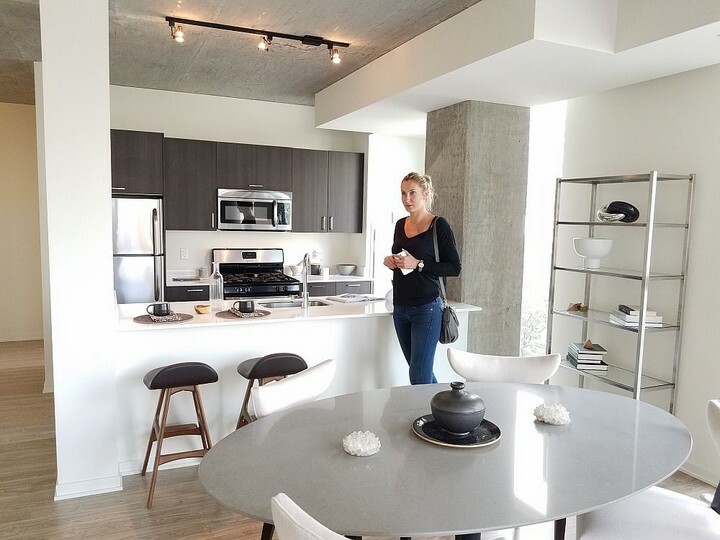 Each unit offers European-style Florense flat panel cabinets, finely crafted quartz countertops, stainless steel appliances and large single basin sinks. Bon appetite! At 1333 South Wabash, modern sophistication can be found in every room. The bathrooms are fitted with a floor mounted Florense vanity with drawers and fully integrated sink. Grohe fixtures and accesories are artfully placed, and spacious showers with a glass enclosure or large tubs, depending on the floor plan, provide you with the relaxation and rejuvination you deserve. 1333 South Wabash exemplifies modern design leading to contemporary interior features. Each apartment comes with soaring ceilings and exposed concrete surfaces that provide an usrban ambience. The rental residences are 21st century modern with keyless entry and solid core doors, brushed chrome hardware , floor to ceiling windows that showcasr the picturesque Chicago skyline and lakefront, modern light fixtures that illuminate across the sustainable laminate floors, and in-unit washer/dryers in every residence. They thought of it all at 1333 South Wabash.